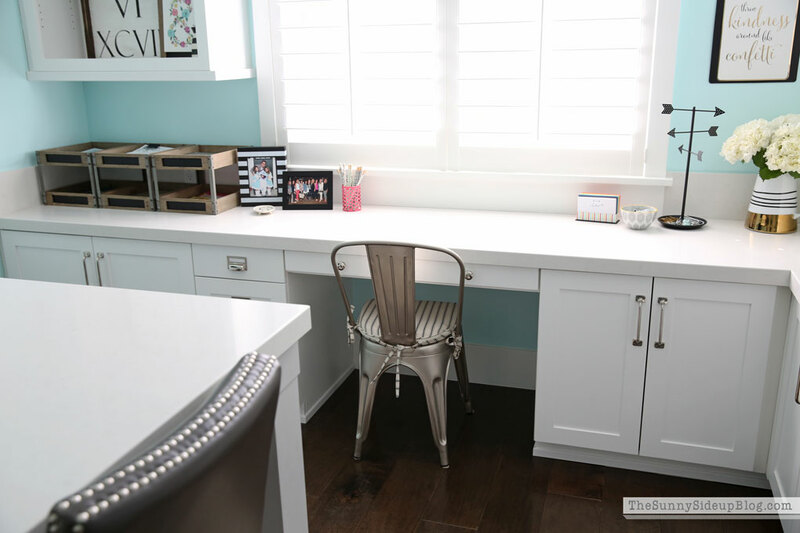 I cleaned things up, organized a few drawers and cupboards, and shared lots of pictures of my new office in this post. It was a wonderful blank slate! Here is what that blank slate is looking like today! Soon after we moved in I knew I wanted to change the light fixture in this room. The previous light felt too small for the space and had a horrible glare. Not practical for a room the kids and I pretty much live in. 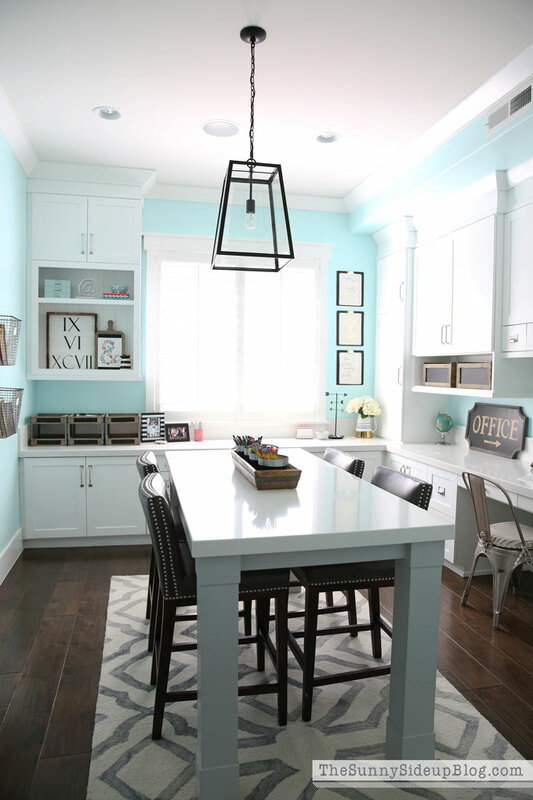 I had my eye on this pendant light from Ballard Designs and knew it would be perfect! Exactly the look I was going for and it matches our staircase light (stairs are right next to this room). Because of the bright wall color in this space I wanted to bring in more neutrals/blacks to tone things down a bit and make sure the room didn’t end up looking like Rainbow Brite’s summer cottage. (Did I date myself there? Anyone else remember Rainbow Brite?) :) I considered several rugs for this space (almost ordered this one or this one) but then ended up falling in love with this simple grey geometric rug from Rugs USA. 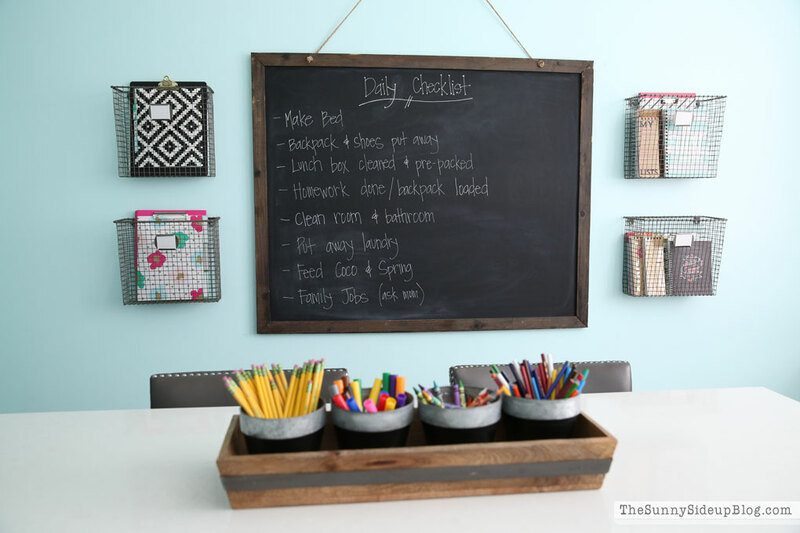 The baskets on the sides of the chalkboard are from Ballard Designs and are perfect for holding miscellaneous items. 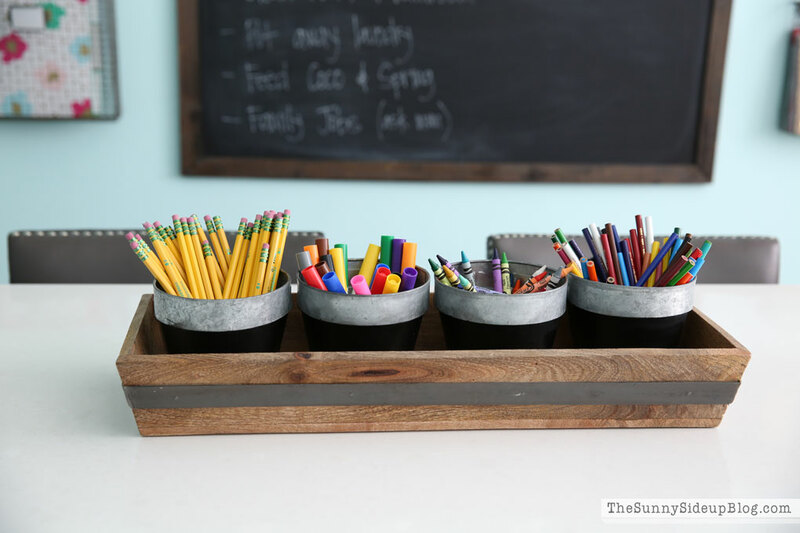 I’ve had this wooden tray for years and love using it to corral our school supplies. I buy new crayons often because something about sharp, new crayons just makes me happy. I’m so in love with these wood and metal 2 level trays from World Market! 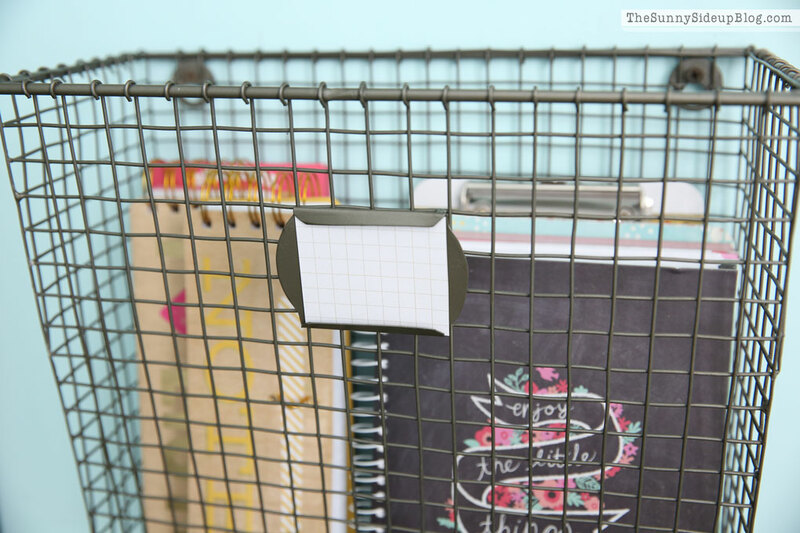 They really help me stay organized. I still need to label them and I’ll share how I’m using them at some point! 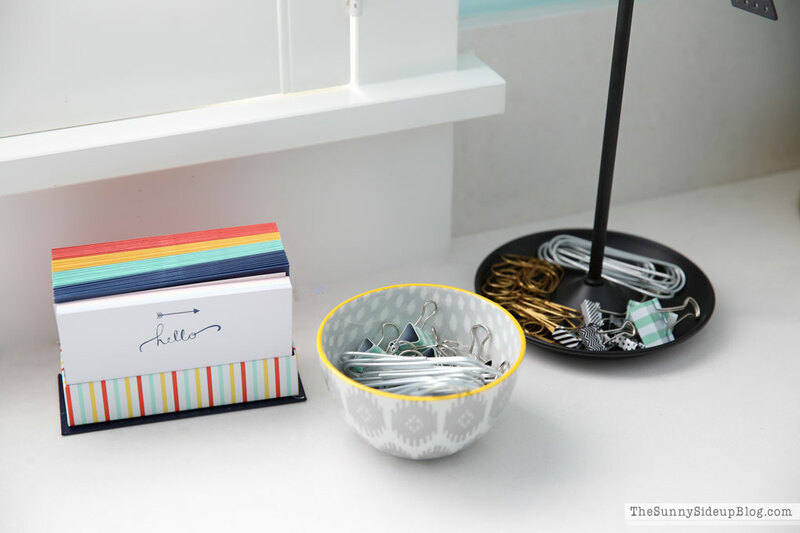 I’m sure my shelf decor will be switched up often, but for now I have some simple items from Home Goods on the top shelf along with a favorite organizing book, cute notepads and a favorite bowl from Anthro. On the bottom shelf I put one of my favorite signs from Jaxn Blvd. I first shared it on my console table decked for fall. I love it on that table and may move it back when I find something else for this room. (Things never stay in one place around here!) :) The roman numerals are September 6, 1997 – my wedding date. 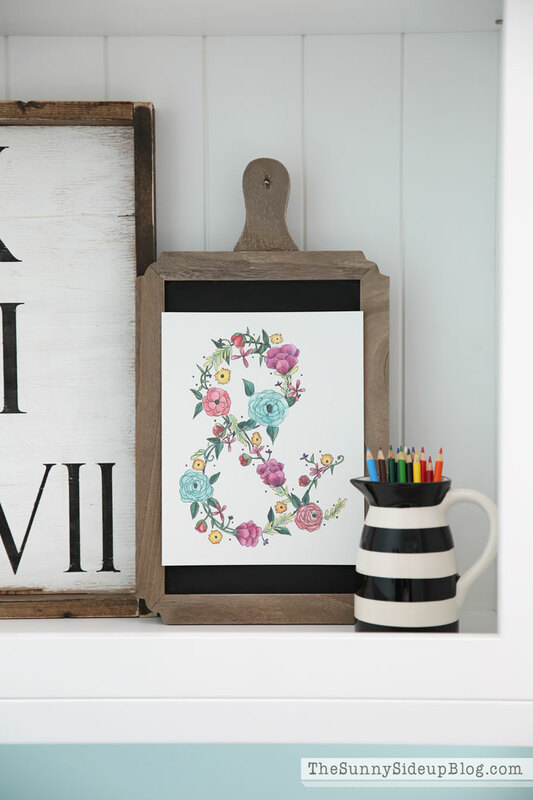 This adorable ampersand print is from my friend Abbie’s fun shop Paint and Prose. The colors were perfect and I love the touch of whimsy it adds with the industrial/wood decor I have going on in this room. Small striped pitcher is holding a few colored pencils and is from Target. This desk is where I work! My kids have taken over the big computer so I’m always here with my laptop. I cleaned my workspace up just for you, but it will most likely never be this clean again! I knew I wanted industrial looking chairs in this room and debated several options. 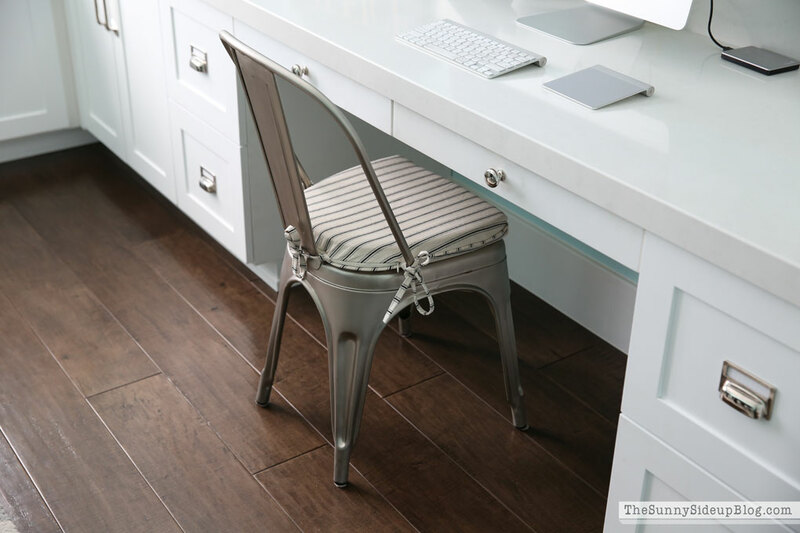 I liked our dining nook chairs in this space and also looked at this option from Crate and Barrel, but ended up going with these Marian metal chairs from Ballard Design. I especially love their striped cushions! 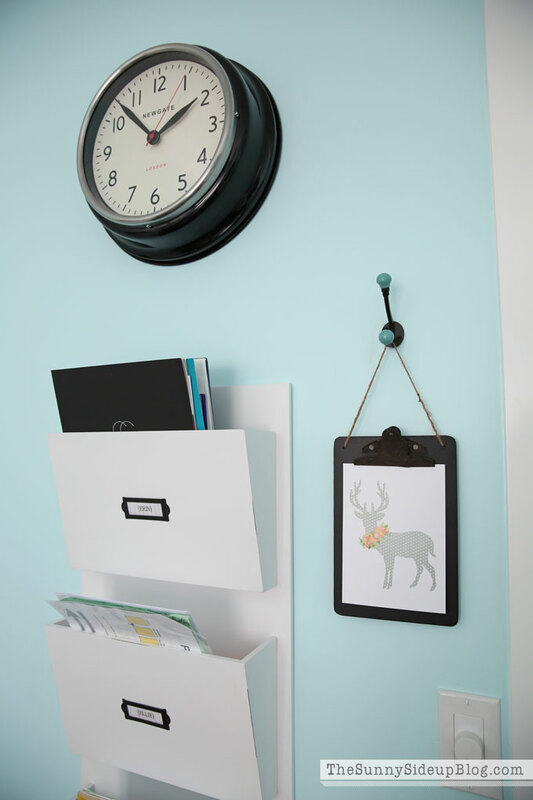 I knew I wanted black clip boards for this wall and after searching and not finding what I wanted I was almost ready to paint my own. Then I came across this set of three at Home Goods and I seriously think I squealed out loud in the store! They even came with a stack of gold lettered quotes! I had to explain why I was so elated to the lady in the aisle next to me because she was looking at me and laughing. I couldn’t contain my excitement! That was a good shopping day. The quotes I have in the clipboards at the moment say “every day is an opportunity to make a new happy ending” and “throw kindness around like confetti.” I liked those two. :) I also have an arrow addiction and loved the arrow print so it’s in the middle. These will be fun to switch out with other quotes or my kids’ art work. 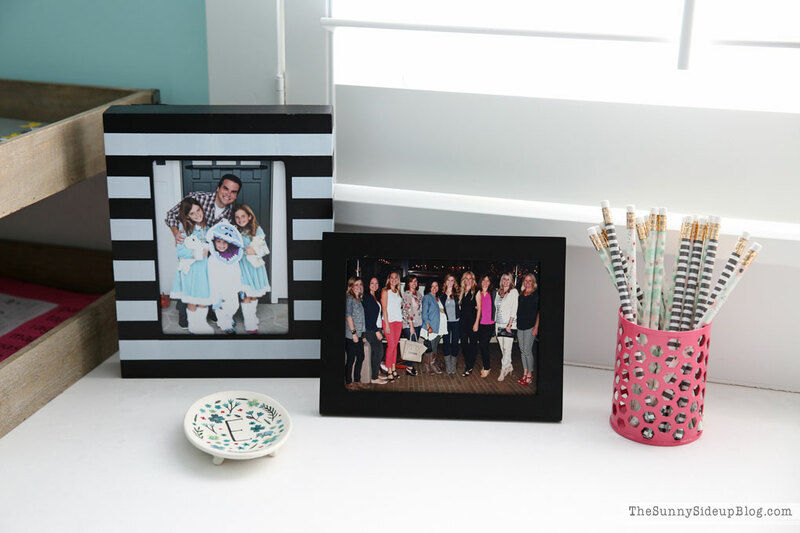 My striped Target pitcher has made the rounds in my house, but for now I’m loving it in my office! 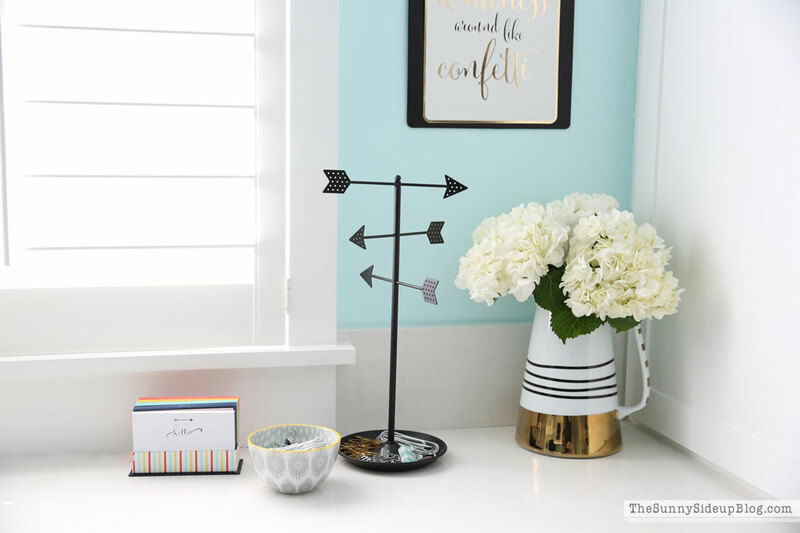 The arrow stand (I think it’s a necklace holder?) and note cards are also from Home Goods. You can find the bowl here. 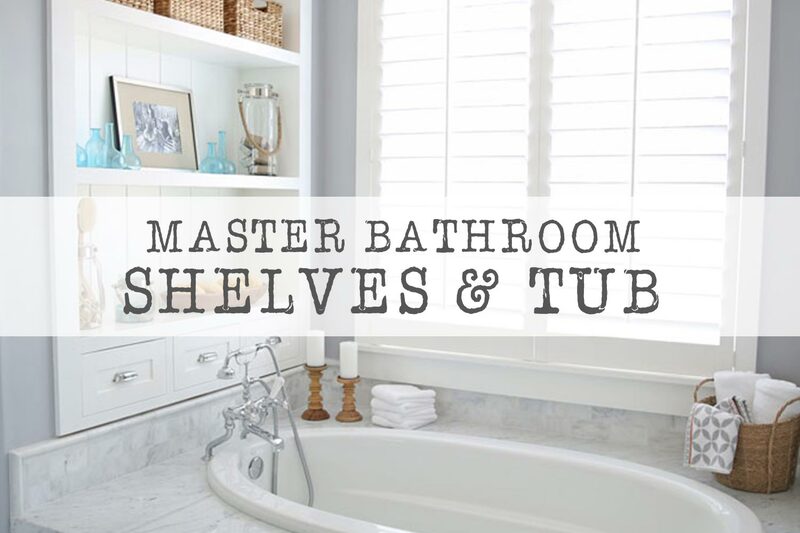 I love the baskets I previously had in this space, but not so much for this room so I moved them to my master bathroom and went on a mad hunt for the perfect baskets for these open shelves. Not easy to find something I loved with the exact dimensions I needed that was also a closed basket (I want to hide things in these!). After searching on-line in every store I could come up with I finally landed on these beauties from Magnolia Market. (These are the large size.) I’ve had them in my pantry for over a year now (I know! still need to do a pantry post!). It finally hit me that I should try them in this space too. Perfect fit. Perfect look. Thank you Chip and Jo! My love for you two grows daily. 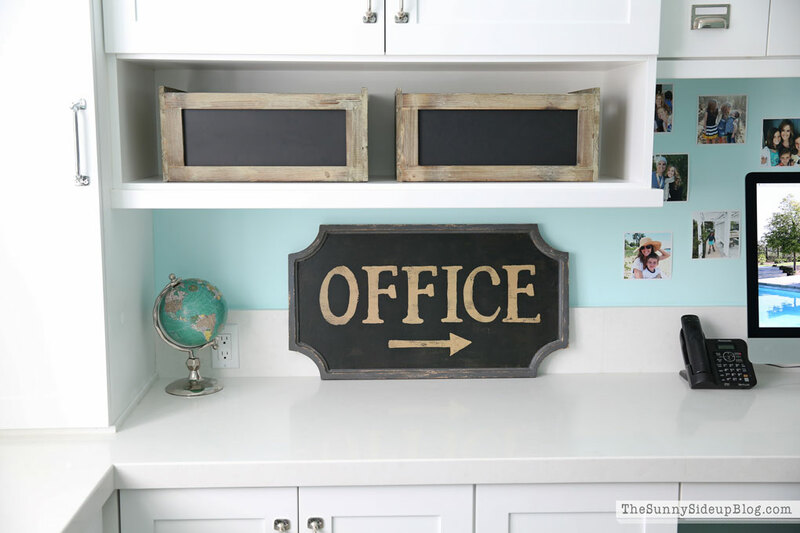 My vintage office sign I shared in a Friday Favorites post is from Painted Fox and you can still get 25% off! 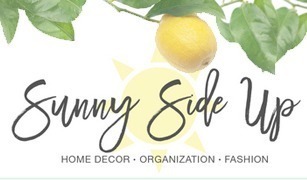 Just use the code SUNNYSIDEUP25. I love the look of it in this space. Arrow and all. My desktop screen saver is a pic of our backyard (is it summer yet!?). I put some fun IG pics that make me happy around my computer (just used painter’s tape to hold them) and I keep going back and forth on whether or not it’s too cluttered looking? For now they are staying because my kids and I love looking at them every day. A fun and easy thing to update and I love getting pictures off of my computer and out where we can enjoy them! That’s it! Quite possibly one of my longest posts ever! But this has turned out to be one of my most favorite rooms ever. I think the reason I love it so much is because it’s just so me. It’s a mix of everything that I love. I smile every time I walk in. That’s the goal with decorating your house, right? Not everyone needs to love your home.. YOU need to love your home. 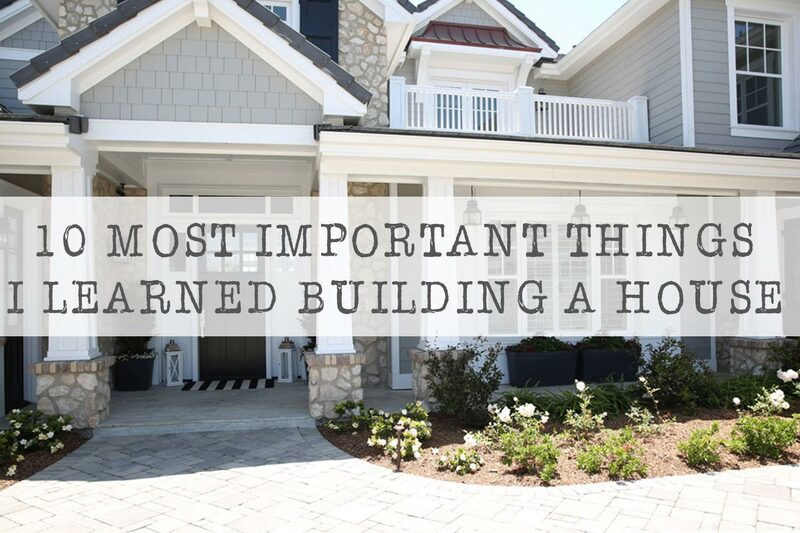 Surround yourself with things you love and your house will inspire you and make you happy. This room makes me very happy and I’m so grateful I get to share it with all of you! Now.. time to roll up my sleeves, take off my jewelry, put my hair in a topknot and get back to work! More details on this space: The paint in this room is “Tinted Ice” by Dunn Edwards. The room size is 15 1/2 x 12 feet. I designed the layout and had the cabinets built custom. I also designed the table and it was custom built. The table legs are painted in “Seattle” by Frazee and the top is a slab of quartz (Organic White – Caeserstone – same quartz I have in my kitchen). Organic White quartz is also the counter tops in the perimeter of this room. Your office looks so good. Love ALL of the decor. Taking your time really pays off. I’m the same way. Although, sometimes even after I take my time I still return stuff. I think return more then I by. I have a question. Do you have the name of the white that was used on your baseboards. Our wood floors are being laid soon but I am still trying to figure out the white that I want used. 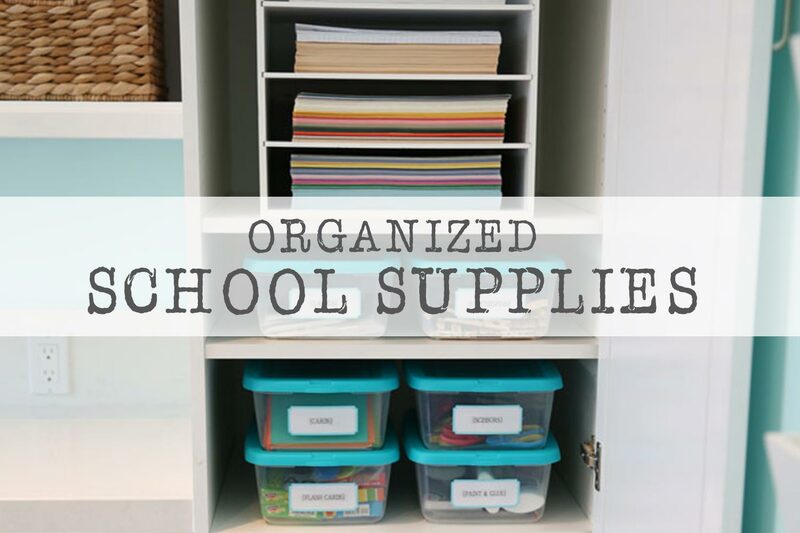 It looks amazing (and organized)! You have serious talent girl! 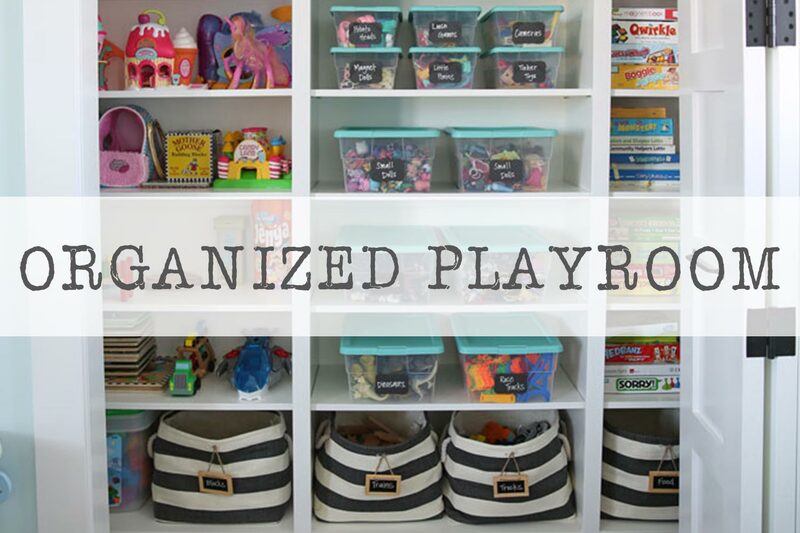 Can you come decorate/organizemy office now??? Very nice Erin! The colors looks so good together! I really like the print from Paint and Prose. i would like to get one for my kitchen as there are some really cute ones. Do you have a link for the board you have underneath it? I think I found a chalkboard very similar. What size of print do you have from Paint and Prose? Just delete the email that I sent you. This is such a beautiful and functional space! As a home decor and DIY blogger this is what I literally dream of having! 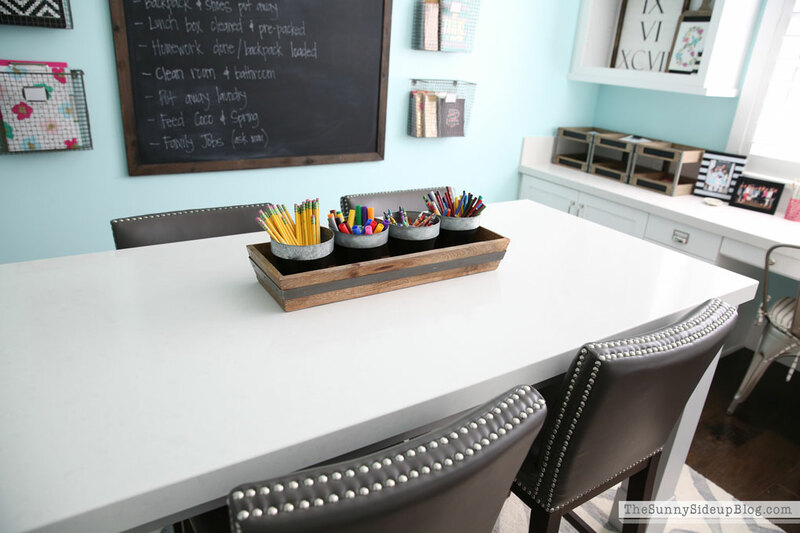 You have a computer space, another work space by a window (crafting pictures) and then the large center table. 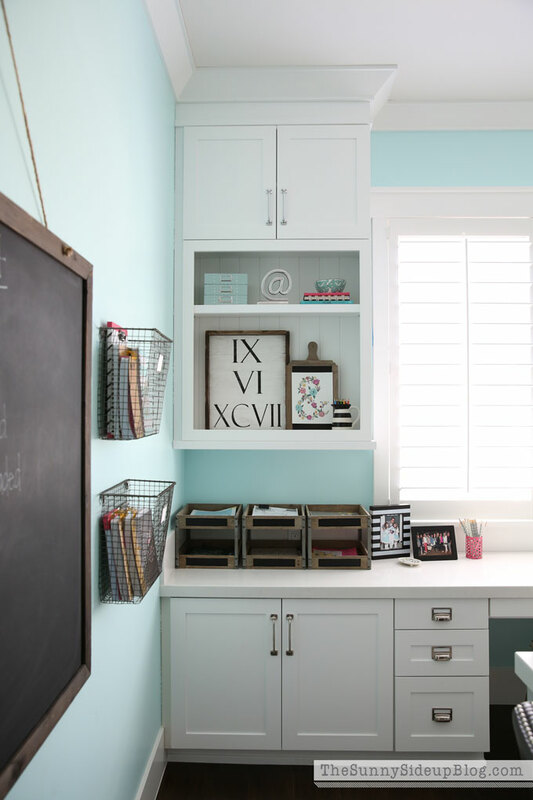 We plan to move and purchase a larger home this year and on my must have list is a work and craft room for me. My kids and I also spend a ton fo time creating, painting and crafting together so to have a big room like this for us all would be great. I will be using this as inspiration for sure! I love love love the little file drawers above your computer. Are you currently using them, or are they empty? What are their dimensions? Wow! Such an amazing work space. You’ve thought of every little amazing detail, Erin, and it looks incredible!! I very much remember Rainbow Bright. ;) I love this space, not that that is a surprise. I’m glad you have found so many things you love to decorate it. Looks cute, Erin! Love the black and white! Looks so much better decorated, lol. I really like the chalkboard in there. It just works. So many fun touches. We love this room so much, we are turning our bare ‘computer room’ into an ‘office/craft room’ similar to yours. I’m building the cabinets and table myself, so mine might take a year to complete, but I have drawn up plans and started the cabinets. Her post made me cry, too! What a sincere person! It made me wish she were my best friend! Thanks for being you, Jeanne! Beautiful room :) Everything is perfectly coordinated without being obvious or overload. Love it! Where did you get the card pulls for the cabinets? 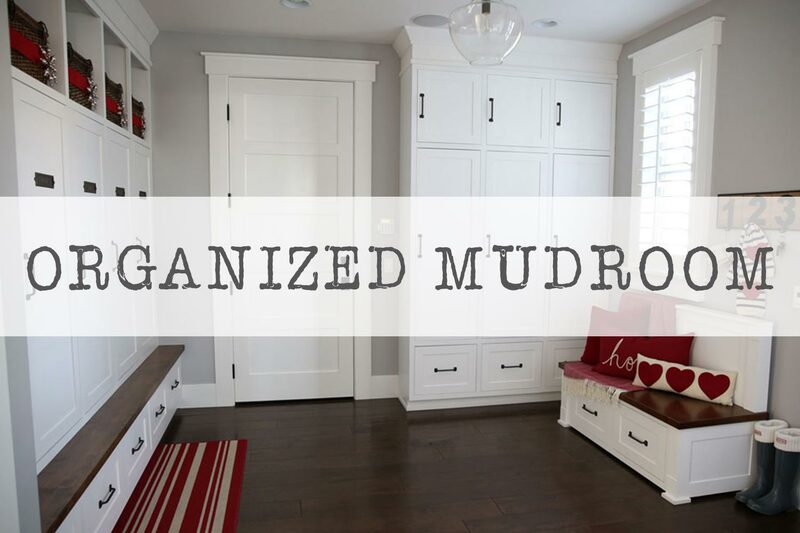 Ive been searching for some for our home office redo. Thank you Celina! So happy you like it all! I ordered those card pulls from an on-line store called Lee Valley! Totally random and I can’t remember how I came across their store, but I was so happy when I did! I hope they still have them for you! Oh this room makes me so happy! It’s so cute I can hardly stand it! Wow Erin — It turned out fabulous! 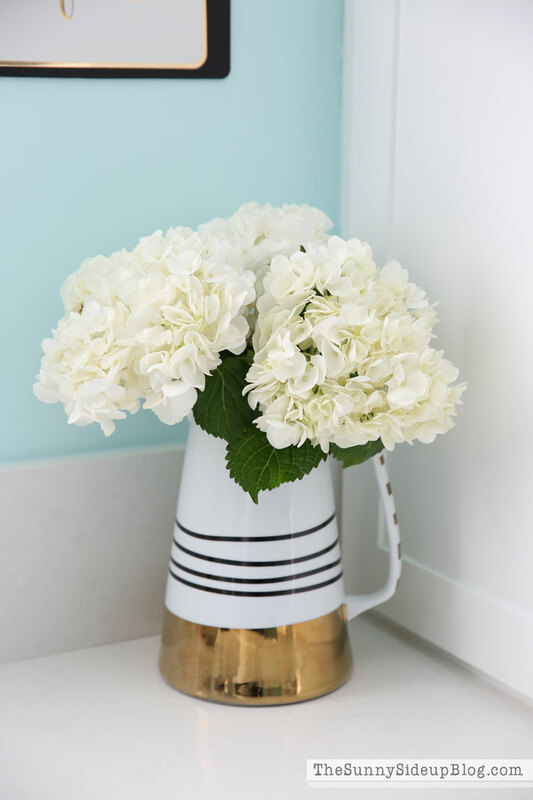 Love everything about it and your special touches! Beautiful room. Love the paint color and design. (Definitely does not resemble Rainbow Bright’s cottage LOL – and yes, I too am dating myself – loved watching that show when I was a kid). Great details from the bowl from Antro to the hardward, I love it. Thank you for sharing. It looks great. I love how bright it is. The pictures behind the computer–a must stay!!! Oh I love this Erin, looks great!! I’m like you, a slow decorator, but I think a room turns out so much better when time has been taken to put it together. 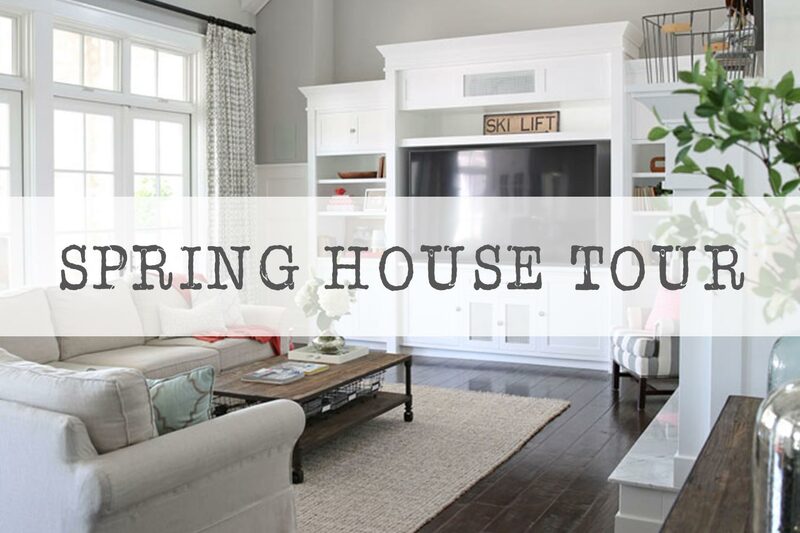 I have tried to rush the process before and never end up loving it so I think taking your time to find pieces that you love results in a beautiful, personal, LOVED space! Thumbs up! 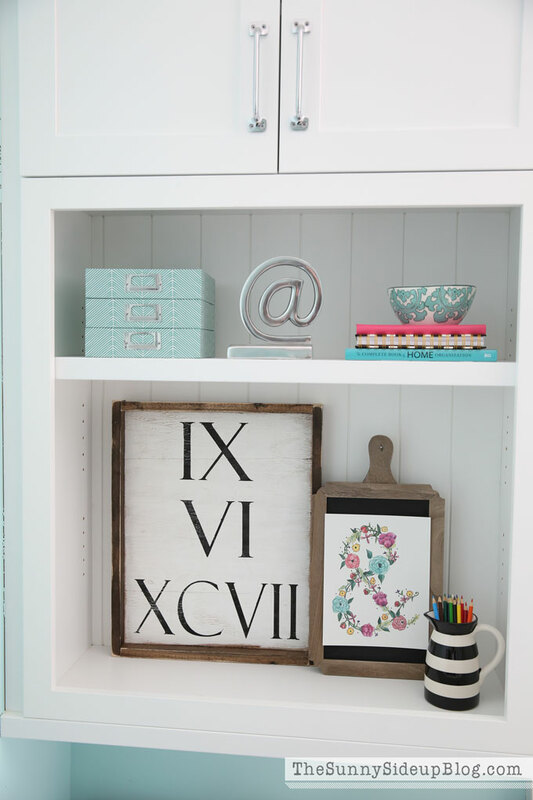 I love the Roman numeral sign! Where did you have this made? Absolutely love it Erin! 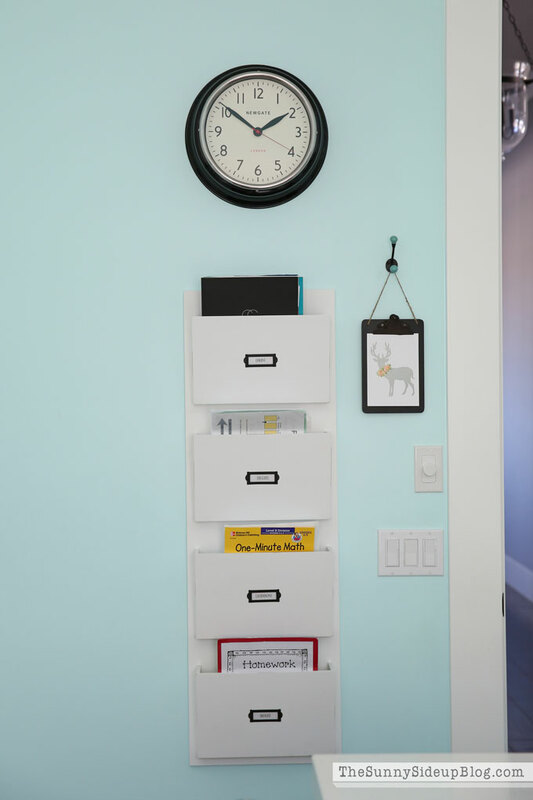 Especially the clipboards on the wall! So cute! 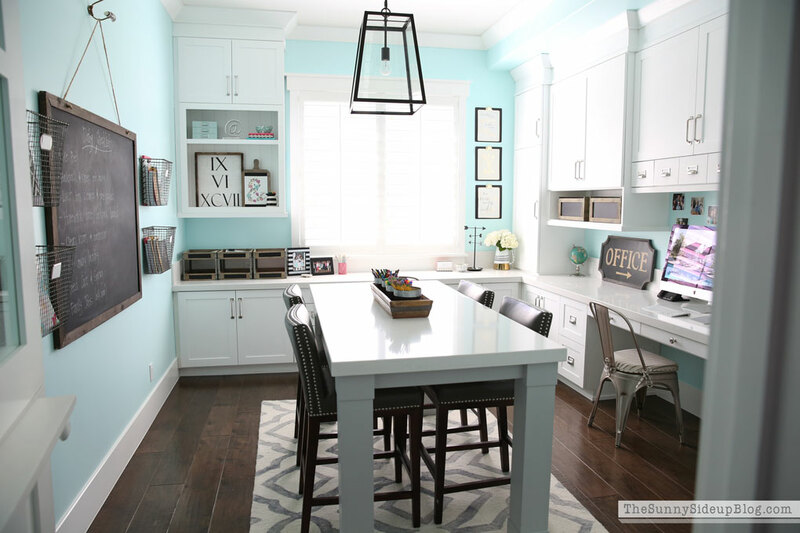 I love, love, love your office/ craft room. I love how much space there is to actually work. A couple of kids at the table, someone at the computer, you at the desk. Plenty of space and none of that “he’s touching me” business going on. My favourite section is that little nook with the 3 clipboards and the pitcher with the flowers :) I screenshotted (?) it and sent it to my MIL the other day when I saw it on Instagram because I’d been telling her how the gold pitchers are a Thing. She has an original glass and gold-dipped one from a gazillion years ago! Vintage! PS I also have a ring bowl (it’s actually a salt bowl!) next to my computer because I like to take my rings off when I type! Gorgeous-but I didn’t expect anything less from you! LOVE you and your style! Really enjoyed this post-thanks! Love your room…actually, I LOVE your whole house!! 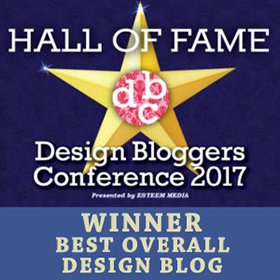 Have you done any posts about the planning & designing process you used when you were building (I think that would be a VERY helpful post/series!). You’ve got soooooooo many awesome, custom built-ins, how on earth were you able to figure all that out ahead of time???!! Can you please share the room dimensions of your office? We’re currently in the “blueprint” stage of building our next, & last, home & figuring out what size room we need/want is proving to be very difficult. And frustrating. I’m sure most of it’s my imagination, but, “all” the rooms in blogland &/or Pinterest tend to appear HUGE. I’m glad I discovered your blog & became a subscriber…I look forward to seeing an email that you’ve got a new post for me to drool over…Thanks!! Erin, I am in love, your room is so beautiful and functional!!!! I discovered your Blog long ago and have become your ” stiller Bewunderer”! 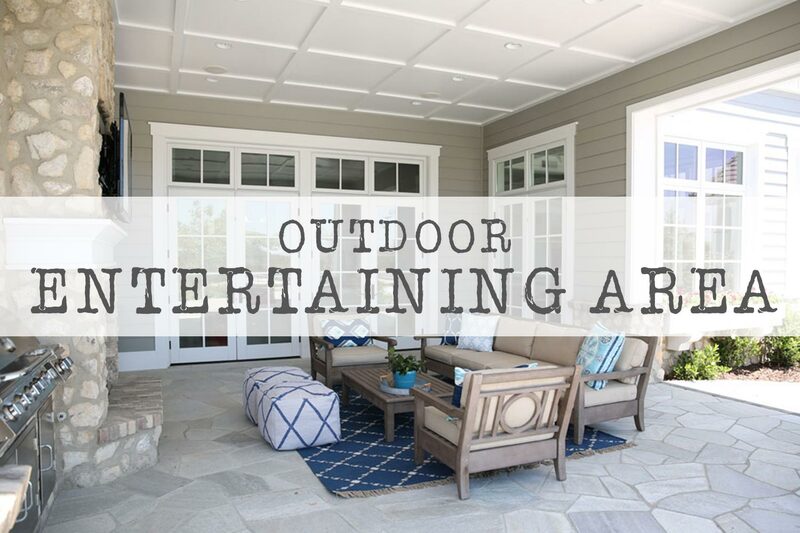 Love everything about your house, the outside area and your special touches! It is heavenly! Thank you for sharing. Erin , thank you ! I will always have “good words” for you and your blog! Maybe with little mistakes ;) sometimes I don´t find the right translation! Sorry, please excuse me! I love what you’ve done in your office, Erin! The before picture was plenty clean to me and the after picture even better. It still feels open, spacious, simple, and clean even with all the added decors. The light fixture looks great and the industrial look is perfect for the space. I especially love all the storage you have there and I can’t even imagine how it will all be filled. I imagine the same about your kitchen storage too. 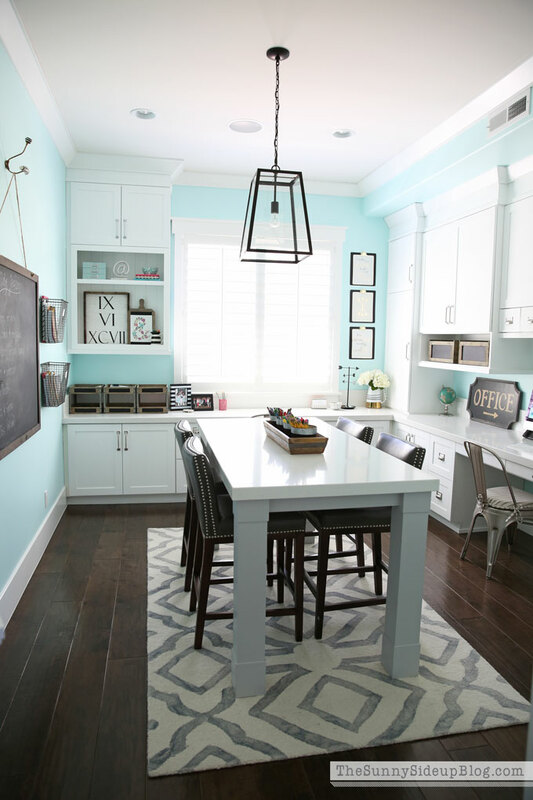 I also love (how often can I use this word) the quartz counter tops, and wondering how you were able to put the rug under the desk since I’m guessing the desk is quite heavy. 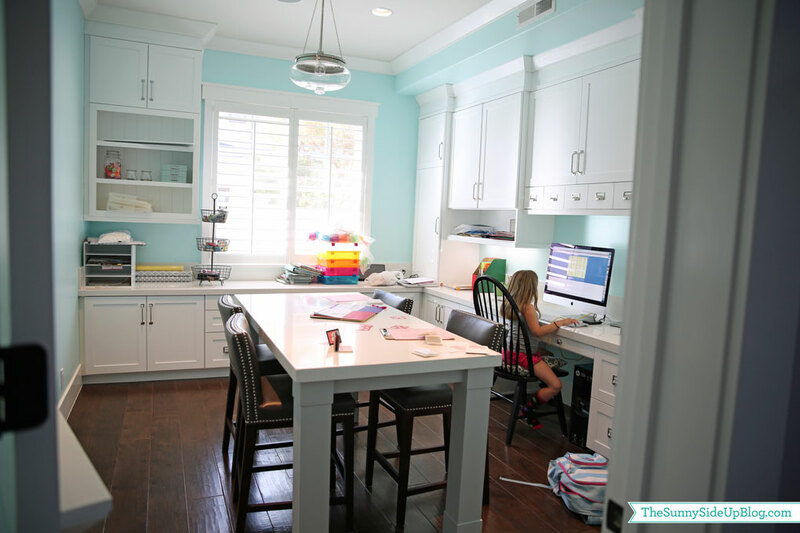 This is definitely a dream craft/homework/office space! Great post! Everything is so fabulous! Thanks for sharing! 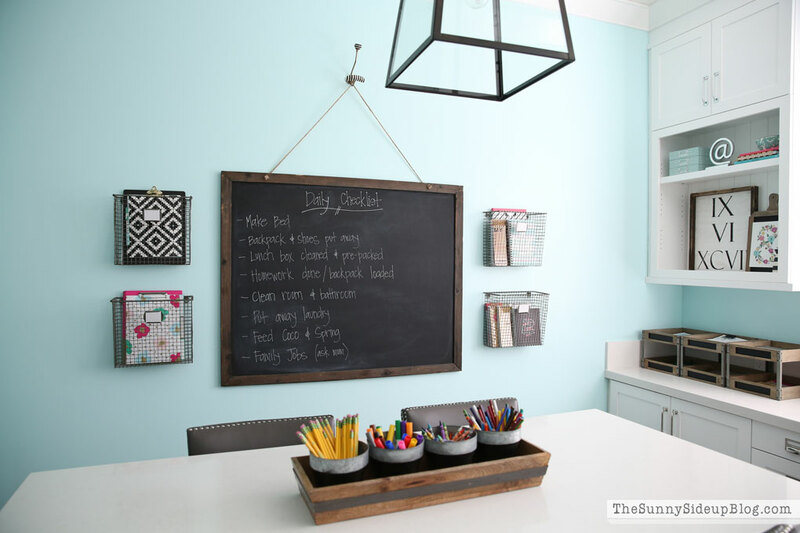 the room looks fabulous, the color is calm and relaxing, just like going to the beach :) and the extra elements of wood, black chalkboard goes so well. I do have a question, what type of wood did you use for the build in cabinets? i stay away from white because for me, its hard to clean/wipe all the time. i do not like laminate/compressed boards. and they are so heavy :( i prefer quality materials that resembles natural wood. and that dutch door, such a clever idea. thanks! 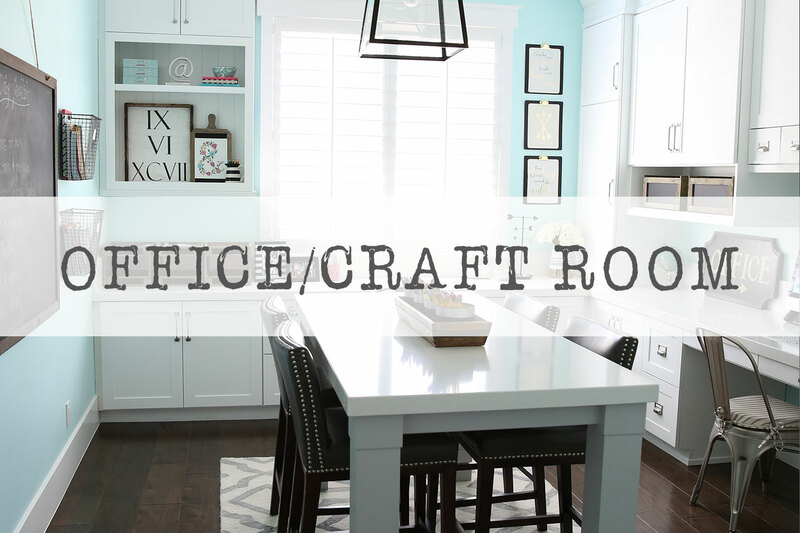 Your office-craftroom is amazing, Erin! My hubby might miss some meals if I had a space like yours….it’s hard enough to drag my bum away from the tiny little room I have. My room is a happy color similar to yours! Absolutely love it, Erin! Kudos, sister! 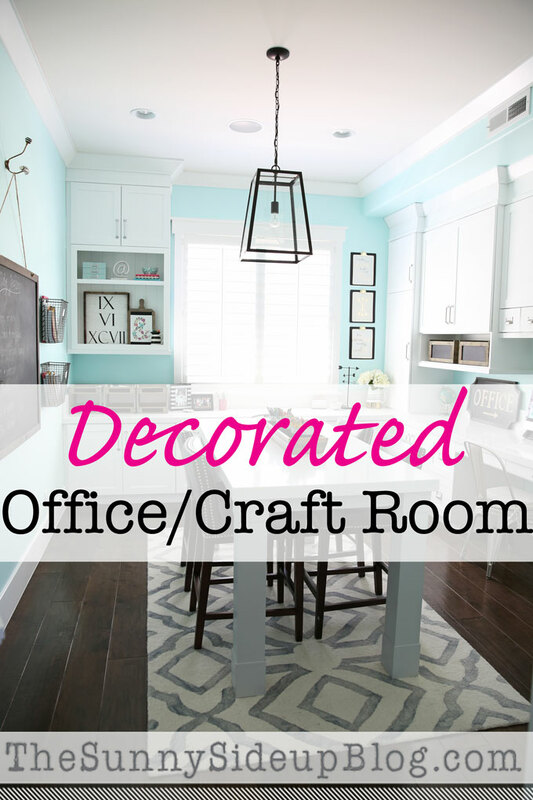 I just discovered you on Pinterest and i have to say I LOVE your craft room/office. Your room is so inspiring and what I’d love my room to look like. I did want to ask where you got your area rug from. I’ve been searching for months for a cream/gray patterned rug and just haven’t found anything I really like. I love the one in your pics and I’m hoping it’s something that might still be available. This is the next room in my house I want to finish. 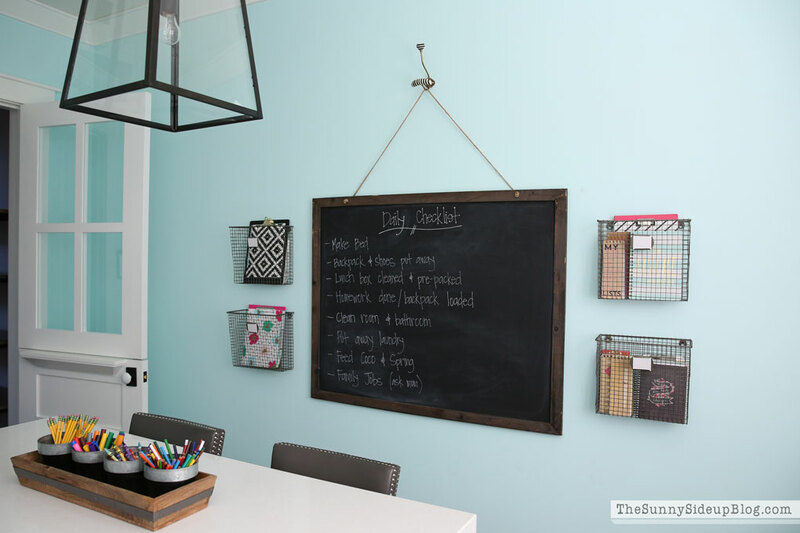 I did ship-lap a wall and then create a gallery but the adjacent wall is still blank… a chalk board and wire baskets is exactly what it needs!! Seeing yours really inspires me to get going! I spend so much time in our office and I should love it! Where did you get your hardware? I’m having such a hard time picking hardware for my house! Erin, just looking at your office design again today. I really like your chalkboard! I can’t tell — is it old or made to look old? 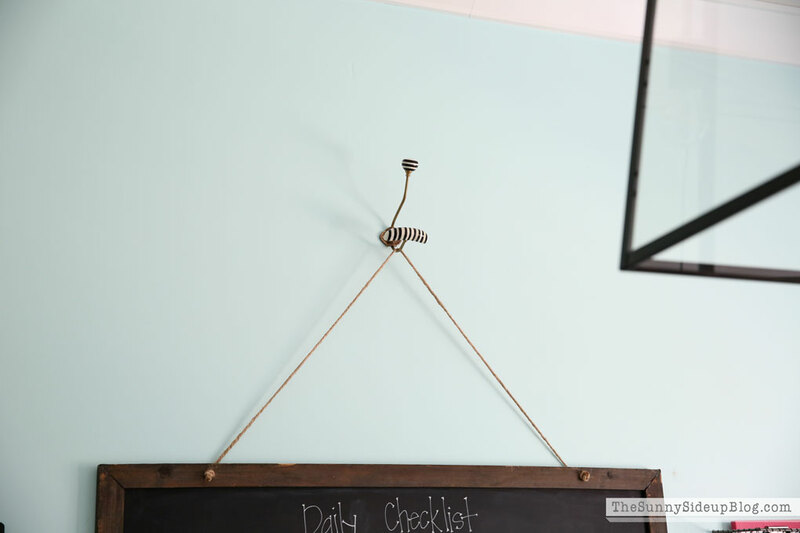 Any suggestions on where to find one similar? I understand how you found yours — great find! 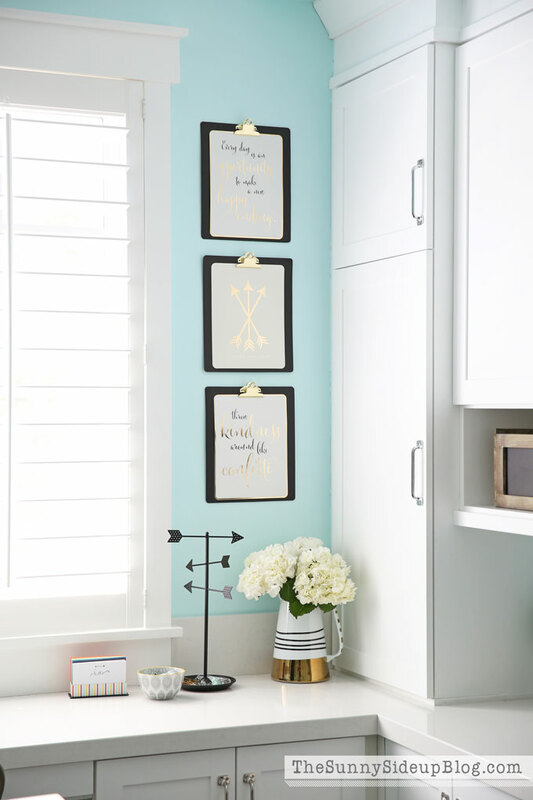 I love the sutch door you choose for this space. We are remodeling our boys room and I would love to install a door similar to yours. Where did you find it? Thank you for this detailed post! We are starting the build process and originally I thought I just wanted an office… for me. Seeing this one makes so much more sense! 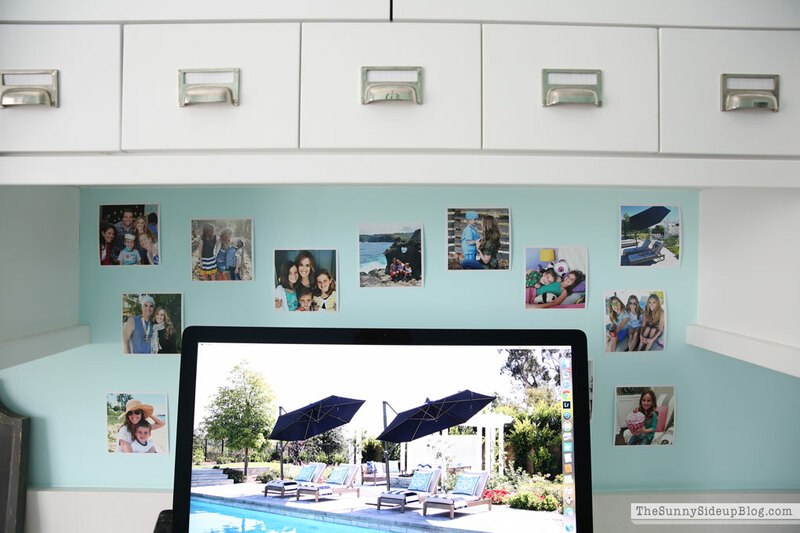 If you’re going to have a dedicated office, why not make it functional for the whole family. Perfection!! 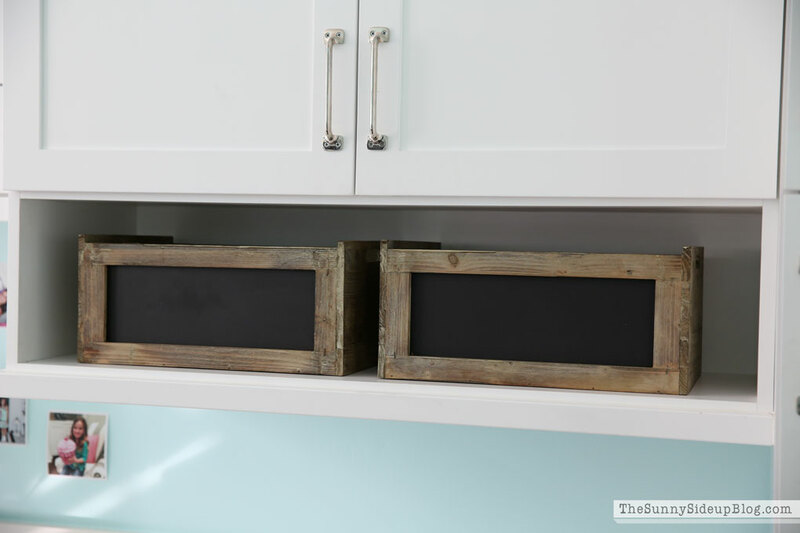 Quick question (and forgive me if you have already answered this one), what do you use the small pull out drawers above the desktop for? With all the other storage, just curious if they’re functional and if you like them. Thanks so much!! What color paint is on the wall? Thanks so much. Super cute style! Truly lovely décor and so inviting. Nicely done. Great room! You have excellent taste! What size light did you get? I’ve been looking at it for a while now and can’t decide on the size for my dining area. I found your blog today and I think I’ve been on it all day long! You are absolutely amazing!! 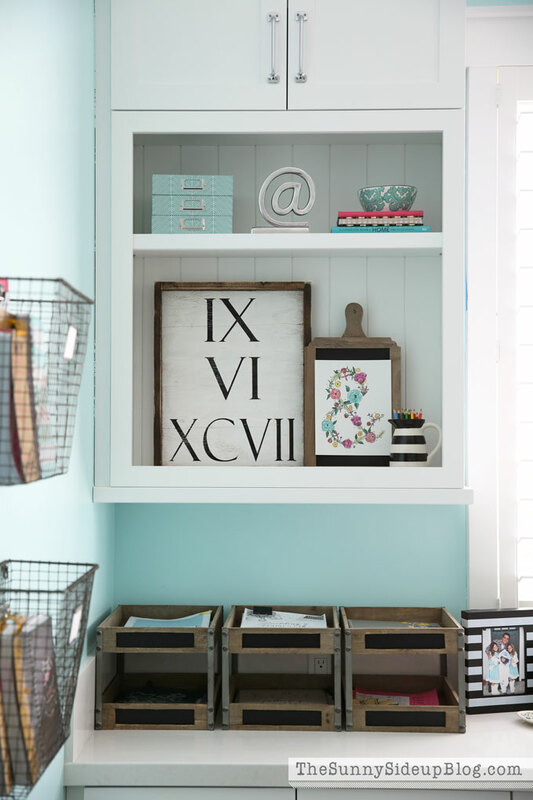 I love how you share your thought process in picking things for your home. 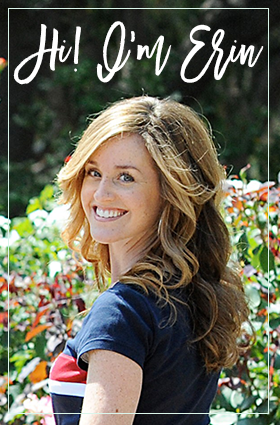 I love your style and your blog….Can’t wait to see more! Hi! Love this space! I might have missed this, but I am curious the dimension of the workspace table in the middle of the room. I absolutely love it. I just found your blog today through pinterest. I haven’t had time to go through everything but would love to know where you got your stools that are around your center table. I love, love, love this room. Every picture has something that inspires me. Thanks for all your hard work to share it with us all. Love your work space! Is the craft table custom built? – i’m looking for one slightly smaller or maybe even square to put in my kitchen breakfast room for use as a work space since we don’t use the room to eat in!! I love your home! 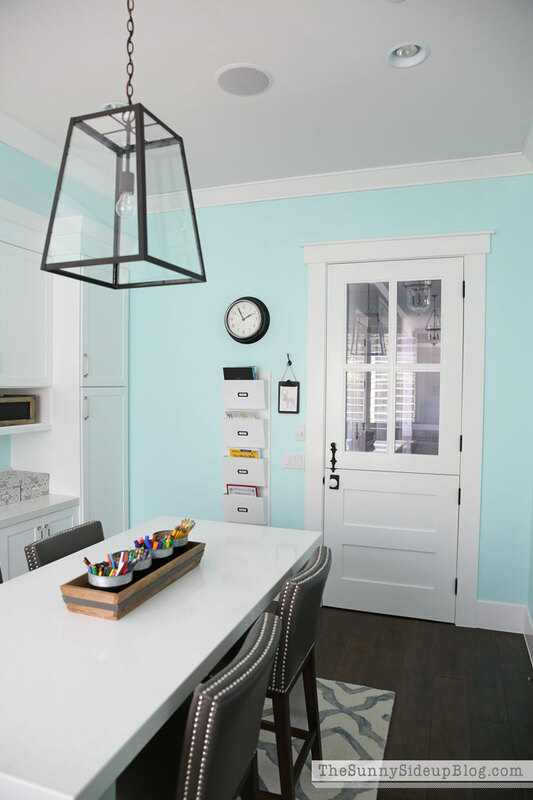 I have used the Seattle Paint in my house after seeing your blog! I am having trouble finding rugs that will match the Seattle and our furniture! Do you think that the rug you have in the craft/office would work with the Seattle paint color? Thanks so much! Hi Caroline! Thank you! I’m so happy Seattle worked for you! 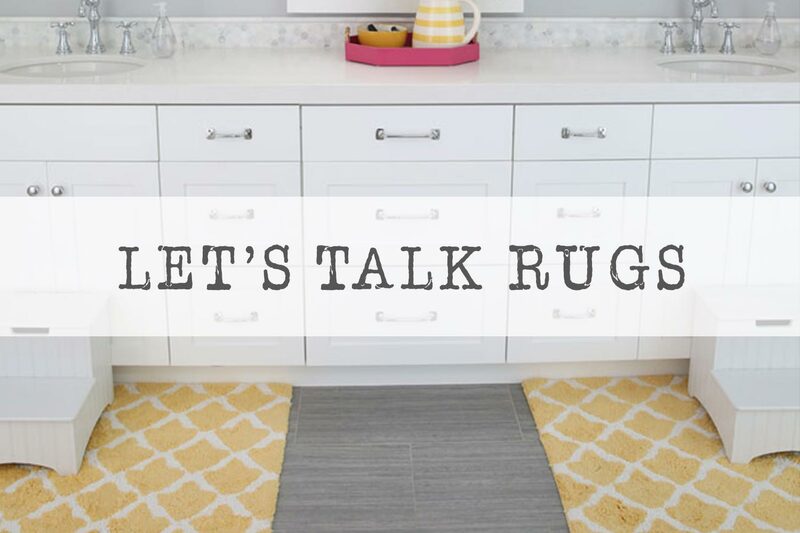 It’s a really easy color to coordinate rugs with.. really anything with soft grays or any neutral cream, beige or jute rug will look great. This rug in my office would absolutely work! If you want something more neutral to go with your furniture the Chunky Wool Jute rug I have in my family room is a good way to go too (I’ll attach a post with info. about that rug). Either would look great! Did I miss the part about where the desk was from? Thanks! Is your table higher than the countertops? Would you mind sharing how high the table is? I love this room! Your built ins are great! 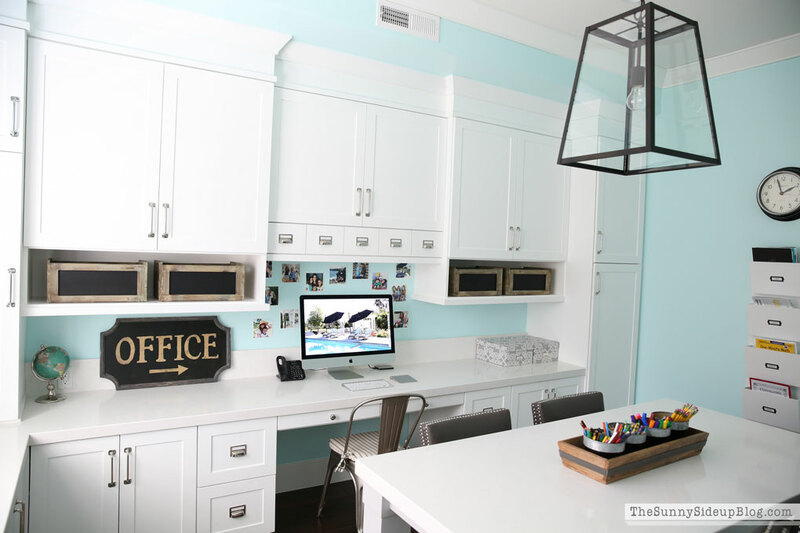 I’ve probably commented before because this is one of my favorite rooms and have used it as inspiration for my office!! Can you please tell me where the hardware is from? Thank you! I love this space! Where do you keep your printer?